Parenting is a tough balancing act. It’s even tougher at holiday time, when all the excitement can have a negative impact on children. Having a flexible approach, setting priorities, and spending your time, energy, and money wisely will help keep kids’ stress at bay and make the holidays enjoyable for the whole family. It’s not realistic for parents to expect children to relax when they are running around like crazy, shopping, baking, decorating, and becoming stressed at the thought of blowing the holiday budget after just one trip to the mall. If parents are experiencing an increase in stress then so are their children. Children reflect the mood of the household and the ideas and values of the family. So if the parents are spinning out of control, the kids will spin out of control, too. Have a discussion before the holiday season begins. Pledge to make the holiday season a time of love and peace, not a time focused on material goods and gifts. Talk to your children about the true meaning of the holiday season depending on your faith and heritage. Kids need some degree of control and predictability. Prolonged uncertainty, constantly changing plans or last minute decisions can all increase stress. Include your children in holiday planning sessions, and let them know the final details well in advance. This will give them a chance to prepare themselves emotionally for the visits, dinners and other running around of the season. Holiday shopping can be overwhelming for kids, so help them decide in advance who to buy for, what to buy and how much to spend. Or even better, discuss with your kids how they can make appropriate gifts for family and friends. Manage your kids’ expectations. Don’t promise things you can’t produce. For example, don’t promise a parent will be home in time for the holidays if the decision is really out of your control. Don’t try and compensate for an absent family member with lots of gifts. What most kids really want is your time and attention. Don’t underestimate how important traditions are to you and your children. Family traditions offer great comfort and security for children when everything in their lives is being disrupted by the holiday season. Focus on experiences rather than spending. Help children think about giving as well as getting. What they can do for the community, even at a young age, helps them understand that the world is about “we” rather than “me.” Propose ideas such as baking cookies and delivering them to a local nursing home or soup kitchen. Ask your kids what they would like to do. Crafts, baking, ice skating, stories around the fireplace, seeing friends are the things that memories are made of. Family traditions are what we recall as adults – not the gifts we got. Help your kids enjoy the holiday season by creating wonderful, stress-free memories that they will carry with them for a lifetime and pass own to their own children someday. Stick to your normal family routine as much as possible. It’s often hard to take time out of busy holiday preparations, but a walk, a trip to a playground or play area, or whatever else you usually do with your kids each day can be a great stress reducer. Kids are often dragged along on shopping expeditions or taken to events over which they have no control. And when a routine is broken, stress can result. If possible, skip unnecessary activities or tag-team as parents. Have one parent do the shopping or run the errands while the other stays home to keep things status quo. It can make a big difference. Try to plan at least one healthy, homemade meal every day. And don’t let your guard down with snacks… a nutritious snack can help a child function much more smoothly through a long afternoon of shopping at the mall. Limit the fast food during the holidays. 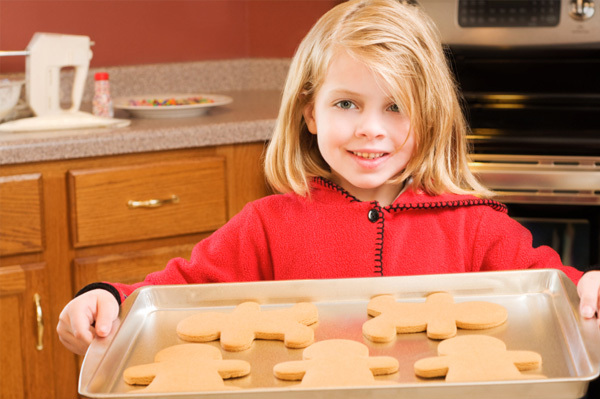 Factor in sugary holiday treats that can cause kids to be hungry and stressed. De-emphasize television. Much holiday programming seems to be designed to get children all worked up about the holidays. Try to mute or turn off the commercials, and be selective about your family’s holiday viewing. Limit the amount of time kids playing video games. Encourage physical activity and interaction with peers. Children who are experiencing some stress usually need more physical activity. Encourage your kids to bundle up and play outside. If you have younger ones, make time for a walk. The fresh air can work wonders. Instead of telling your child to go “calm down” this holiday season, give them the tools they need to manage stress and anxiety. If you see your children beginning to get stressed, try to spend some quiet time with them before the situation gets out of control. Stop for a snack, a game or a few minutes of reading before rejoining the holiday activities. Hands down laughter is still the number one way to relieve stress at any age. Laugh it up with your kids and their mood will shift from good to bad in no time. Laughter is still the best way to beat stress and change everyone’s mood from bad to good. Take time to read the comics to your children, or find a holiday joke book with family humor at your bookstore or library. Parents are the gatekeepers for the level of holiday excitement and stress that reaches their kids. Their ability to parent with flexibility and strength, recognizing and responding wisely when they are their kids feel stressed will help them manage the pressure and tension that can affect everyone’s enjoyment.